Getting there: From Brighton: Take Rickett Rd south. Turn right on Hammel (dirt road). Drive about 1/2 mile. The paved entrance to the Golf Center is on the right, a short dirt road to a parking lot near the more interesting trails is on the left. Huron Meadows is the premier southeast lower Michigan cross country ski venue. Why is it popular? Snowmaking! Huron Meadows has three high efficiency snow guns and puts snow down on a 2.4km loop. 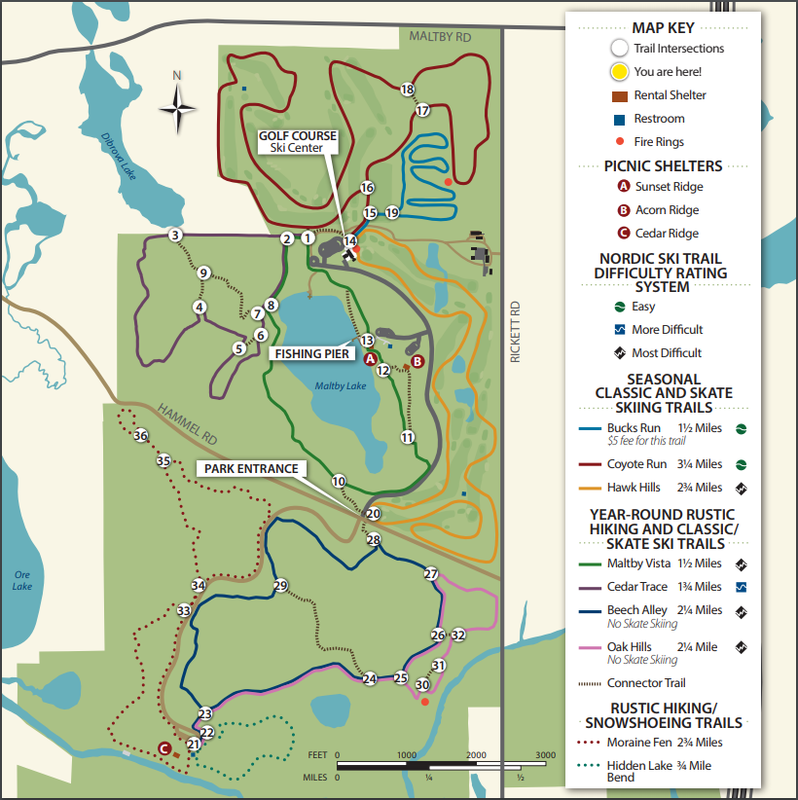 Huron Meadows Metropark is one of just a few parks in southeast Michigan that offers skate-style and classically groomed cross-country ski trails. Choose among more than 15 miles of trails groomed for tracked, classic skiing over easy to moderate terrain, or more than 11 miles of trails groomed for skate-style skiing on moderate terrain with rolling hills. Lights! The man-made snow loop is lit until 8:00pm each night. Fischer CLASSIC and SKATING skis, boots and poles - the only place is southern Michigan where skate gear can be rented. Staff who take grooming seriously and are out grooming the snow at 3:00am in the morning if necessary. Home of Frosty Fest: the Frosty Freestyle and Krazy Klassic cross country ski races. The trails are marked and moderately hilly. All trails are groomed. The 18 km trails north of Hammel Road are groomed for both skate and classic. The trails are partially on a golf course, partially in the woods. South of Hammel Road are 5km of double-tracked classic-only trails with nice little rolling hills and all in the woods. The Ski Touring Center (Golf Starter Building) is open daily for ski rentals and features a heated lounge, restrooms and snacks. Huron Meadows holds the Frosty Fest consisting of the Frosty Freestyle 5km and 15km and Krazy Klassic 8km/12km races, plus a kids race on the second weekend of each January. A park pass is required to enter park. There's a $5 fee to ski on Bucks Run, the 2.4km man-made snow loop (and lit at night) to help defer the cost of snowmaking. No fee to ski on the rest of the groomed trail system.